Google keeps quite a bit of information under wraps. We advertisers play Google’s game in hopes of obtaining the ultimate payoff: The Conversion. We cleverly sculpt ads to end with punctuation in the first description line so IF our ad ranks for the top 3 places it will appear next to the title. Now AdWords will let you know if your hard work creating 35 character sentences has paid off! I mean, come on - Twitter isn’t even that stingy. Google has now allowed us to know where the majority of our clicks are coming from by providing a new segment in AdWords: Top v Side. The Top v Side segment can be found right under the Ad Groups tab. We are also capable of seeing breakdowns by day, week, month, quarter, and day of the week. This is fantastic! As you can see in my screen shot of one of our client’s search network campaigns, they are receiving 9.7 times the number of clicks when they appear in the top 3 places than when they appear on the side. Because this information is accessible for campaigns, adgroups, ads, and keywords, we no longer have to guess if the keyword bid should be higher or lower. Now we can see exactly which keywords allow us to rank higher than the competition and are receiving more clicks that create conversions. This will also help with manual bidding. The estimated first bid column doesn’t seem to qualify for this top secret information, but now I probably won’t even use that column very often. 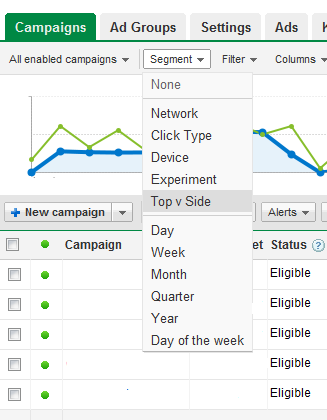 With the Top v Side segment, I can see the Avg CPC for top clicks and the Avg CPC for side clicks. If it’s only a few cents different and all other variables between the competitor’s campaign and mine are the same, I can then push that specific bid up slightly to knoc k them out and hopefully receive the conversion. On the down side, this may make it more expensive to rank for the top 3 spaces as all of your competitors will also have this information. If after implementing this new segment you find that your CTR is higher on the side than on the top, that’s ok. This most likely means that your ad content is what’s driving your traffic. 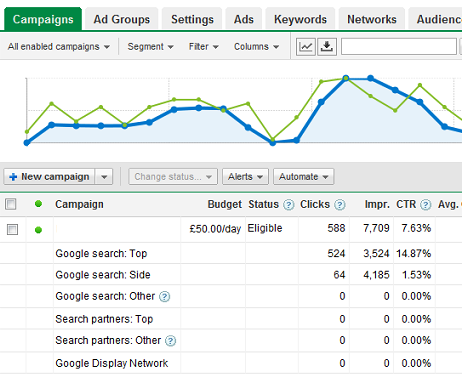 Use the Google Ad Preview Tool (under Reporting and Tools) to see what your competitor ads are saying. If there is nothing individually different about your ads, check the format of your ad. Did you make the first description line a full sentence that ends with punctuation? Does your ad text flow better as a longer 70-character sentence? Compare the ad structure to another ad that is receiving more clicks and conversions at the top of the search: what is the difference? I could also see this information changing account structure slightly, depending on the structure already at hand. 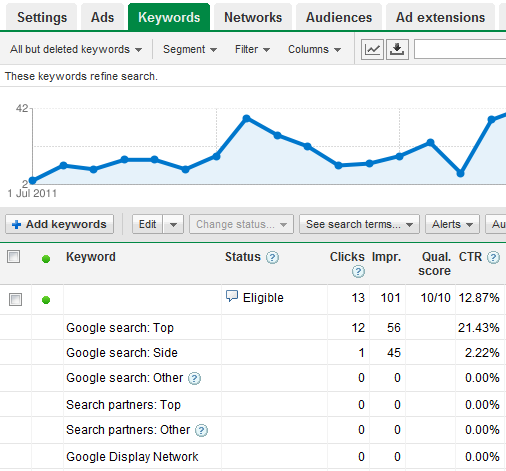 Do one keyword and one ad always get you to your goal? A new adgroup could be created to house only those two converting elements. If the ad doesn’t perform well – switch it out for the next top performing ad and do some real investigative research into what will get your company to reach its goals. Overall, this is a great new development and will allow us to understand more about what is going on and what Google is seeing on their side – always a plus!